Due to the nature of these products, made to order and custom orders may take up to 2 - 4 weeks longer to ship, depending on the finish (powder coated, etc.) and availability of parts. 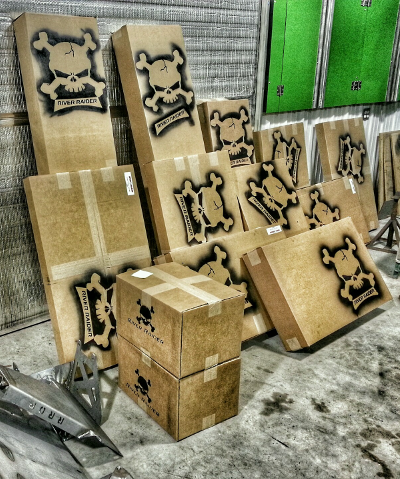 For powder coat / custom orders that need rushed, please call ahead for a delivery estimate before placing your order. There is an additional fee for rushed orders. We reserve the right to upgrade smaller items to 2-day priority shipping instead of ground shipping. If you need a specific shipping method that is not shown when checking out, please leave a note in the comments section when checking out & we will do our best to accommodate your request. If you require express or 2-day shipping, please call us at 1-855-339-2915 for charges. There is an additional fee for rushed orders. If you do not pay for rush processing, then your order will be shipped with our standard processing time which may be up to 2-3 weeks for some items. Rush processing may not be available for all products. When selecting your product options, if rush processing is available, it will show up as a product option with an additional charge. If needed for a specific date, please include in the notes section when checking out and we will try our best to accommodate your timing. Due to unforeseen occurrences, we cannot always guarantee the timing of your rush order. We recommend calling ahead to confirm the timing of your order if your shipping timeline is especially important! ▪ Selecting an expedited shipping option will not expedite your order processing time! We try to ship our orders as soon as possible and in the order received. If you require priority processing, please select Rush Processing when adding the product to your cart. Rush Processing is not available for all items and will only be applied to the products where rush processing is selected as an option. If an item is added to your cart that does not have rush processing available, it may be shipped separately to avoid delays of your rushed item(s). You will receive a quote of the shipping cost when you choose DHL Express to be your shipping method. The price will vary due to the weight, dimension and the value of your package. The customer will be contacted via email by an international sales representative with a shipping quote. Shipping Time: DHL Express shipments will have a very fast and reliable delivery time with full tracking. Typically its a 2 to 7 business day eta anywhere in the world. We can not guarantee international delivery times as customs clearance can hold up any shipment. Customs will vary from country to country. All custom orders or specialty items must be paid upon receipt. No returns for credit can be allowed due to the nature of these orders. This includes powder coated bumpers, fenders and skid systems, once they have been powder coated. Electrical components that have been opened or installed cannot be returned. This includes lights and wiring harnesses. There will be a 20% cancellation fee on all other returns or cancellations. If items were already shipped, the charge for shipping will not be credited back upon return of items. To arrange a return please call our customer service at 855-339-2915 or initiate the return through our website. All returns must include a valid RMA Return Authorization (RMA) number to be credited back.